Five years of research and development went into the creation of Quick Cure. 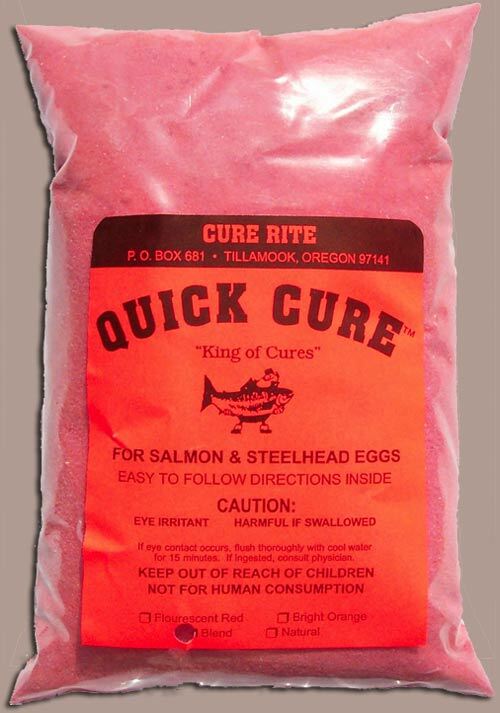 Our goal at Cure Rite Products was to develop a salmon and steelhead egg cure that would produce a professionally cured egg using a process that was quick and simple. We wanted a product to help ALL anglers catch more fish! Hence the name: Quick Cure. Quick Cure is like no other bait cure. It is designed to cure salmon and steelhead eggs in just 12 hours, without being too “hot”. 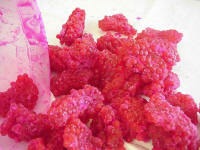 When the directions are followed, Quick Cure will produce custom cured bait, which will have and hold a brilliant color. Quick Cure bait will milk and produce a fish catching scent drift after drift. 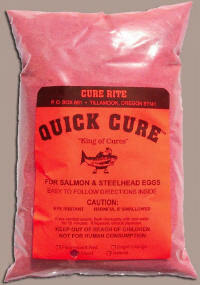 Quick Cure allows you to custom cure your salmon and steelhead eggs, prawns, and herring. You decide how your baits will turn out simply by using less cure to produce a softer cured bait, or more cure for a drier, firmer bait. Storage of Quick Cure bait is convenient. When vacuum- sealed, it does not require any freezing or refrigeration. Several of our customers have requested a “double dye” cure, and we have listened to your requests. New Tide Water Red Quick Cure is now available. It contains the same ingredients as our other colors of Quick Cure, but it has double the amount of fluorescent red color. With Quick Cure, you can expect an easy curing process and enticing bait that will far exceed your expectations. Quick Cure is the King of Cures. Give your eggs the royal treatment.